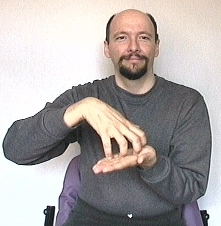 The sign for "weak" places the fingertips of the dominant hand on the palm of the non-dominant hand and then bends the knuckles twice. Since I'm right handed, my left hand stays still. 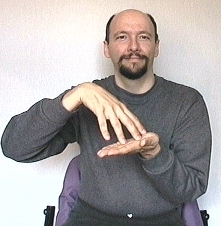 My right hand moves down, up, down. Memory Aid: Think of being "weak in the knees." Tip: I do NOT recommend doing this sign on your forehead and then pointing at your instructor nor your spouse.